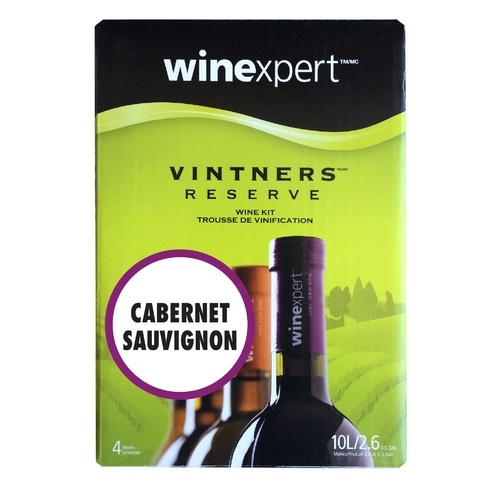 This Cabernet Sauvignon wine kit from Vinter's Reserve is almost as easy to make as it is to enjoy! Vintner's Reserve wines offer excellent quality flavors and aromas. This wine kit includes 2.5 Gallons of concentrate and yields approximately 6 Gallons of finished wine. It is nomrally ready to bottle in about 4 weeks, depending on the fermentation and length of aging. Very reliable results with every batch. Always popular with everyone who drinks it. We enjoy Cabernet I ordered one and my husband want to make 2. Worked well the first time. Used previously and I liked it. My first attempt. Good reviews. Based upon past experience with the kit. Good pairing of quality & price. Wanted to try a new wine for me. Everyone loves the wine I make. I enjoy it too. I can't give too many helpful details for characteristics, but it is good wine! Just using this kit for the first time, so don't yet know how the end product will taste. Good instructions and the wine is now brewing as advertised. I have had good luck with the merlot, so I expect a good tasting wine from this kit. My first attempt at winemaking. Delicious. Simple. Ready to drink in 8 weeks. Have made this wine twice before. Goof proof and gets rave reviews from friends and neighbors. I found it is best to let set at least 6 months after bottling. It gets better the longer it rests. Really great after a year. Also made Merlot. Another great one. My first attempt with this wine (my 2nd overall) I "messed up" and did not properly "degas" the wine. That vintage has a little bit of frizzante to it...but all I have to do is decant for about 20 minutes and it's cleared off. This is NOT a high quality cab sav, so know that you get what you pay for. I am now working on my 2nd attempt with this wine and I am using a different yeast strain, added a tablespoon of cocoa powder during fermentation, and will do some other "tweaking" along the way. If you do this--understand that it will not turn out the way the manufacturers intend and you take all the risk in deviating from the instructions (however, if you know what you're doing--it's well worth it to deviate!). This was a great introduction to kit wines, from someone who has more experience in making beers. Produced a restrained red wine, definitely not a "big bad cab", but certainly something I would be happy to serve. I aged for almost 9 months, racking and clarifying before bottling. Personally, I would recommend buying a real red wine yeast from the excellent selection on this site, as the bundled EC-1118 is a bit boring. Finally, if you're torn about this price point as compared to some bargain $40-$50 6Gal concentrate kits available elsewhere (Fontana or Wine Lovers), I can say having tried them as well, this produces a much better product; starting materials matter. This makes a very good wine. Very easy to make and many compliments from friends. Doesn't take long to age either. This is the third Vintner's Reserve wine kit that I have made, the first & second being a Merlot & Shiraz. It is fresh in the bottles but still is very good to drink. I will continue to use this brand of kit. As the summary states, it is very easy for a first time wine maker, less time and effort than making a batch of beer.